Line-up time: 5:00 – please don’t get there at the last moment. Parade Line-up location: TCUC will line up at the Farmer’s Market on the east side of 5th St East and Wall St. There is a roof (but no walls) over this area and the forecast is for temps around single digits. Dress accordingly. This is where all walking units are gathering. We will be merged into the main lineup when the parade starts. See next paragraph for an inside location to wait until the last minute (around 5:30). 2019 info: Someone will be inside Union Depot Station (between Sibley and Wacouta just South of 4th). Check in there with Lisa Wurtinger who will have a release to sign (St. Paul requires this of riders). We will leave this area in time to get to the lineup area about 2 blocks away before we leave (possibly shortly after 5:30). If waiting at an inside location do not ride your unicycle in the building, even if it looks like a large gym! If you arrive late, don’t count on anyone waiting at the Depot. Come to the Farmer’s Market. Things are colder when you aren’t moving. For those at outside lineup, Art Kotz will have a vehicle near or in the Farmers Market (outside lineup area) to drop an extra layer in right before we start moving if possible. This means you will have to come back to the start after the parade to pick it up, though. Don’t wait till the last second to drop it off, though. Giraffes: (2019) Giraffe riders are being coordinated by Connie. The end of the parade is difficult, with cobblestones and cable guards, so no unicycles taller than 6′. Lights – TCUC will not be providing any lights or glo-sticks. However, you are encouraged to decorate your unicycle/person with lights. Several members have purchased lights and will be putting them on their unicycles, so go for it! Remember though, secure them tightly and make them safe so they don’t come undone in your spokes (this has happened). 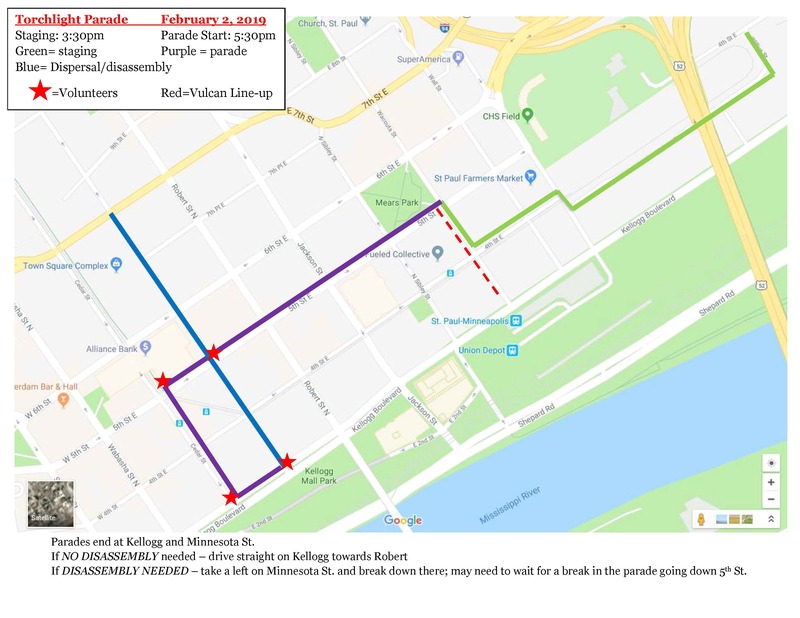 Parade Route: 5th & Wacouta, travels westbound down 5th Street to Cedar Avenue to Kellogg Blvd and ends at Minnesota Street near Kellogg Park. See the parade map below. Special Parade Attire Note: Because this is a winter parade, the dress code is relaxed somewhat. While we would like everyone to look coordinated, the primary goal is to stay warm. If it is snowing, remember that melted snow will leave you wet and cold, so an outer layer that will shed the snow (like a rain jacket or ski shell) will make a big difference. Here is what to wear: TCUC sweatshirt (not hoodie) or t-shirt over a jacket. Dark, white, gray or blue jackets are preferred. Alternatively, TCUC jacket over warm layers. Black pants. Solid black preferred, but other dark color ok. Black shoes or boots of any color. Hats and mittens. Dark or blue color preferred. TCUC isn’t providing water at this parade, but it is dry out there. I recommend bringing a water bottle in an inside pocket where it won’t freeze before we start. After parade event: 2019 – We’re meeting at Davanni’s afterward to socialize and eat. We’ll be at the Davannis at I-94 and White Bear Ave about 5 miles east of the end of the parade. TCUC does not pay for this event. Parking could be difficult, but there are ramps around. Near the start is Union Depot parking. There are other ramps near the end, though there will be plenty of other people in town too especially when you get close to parade time, so leave some extra time to get there. 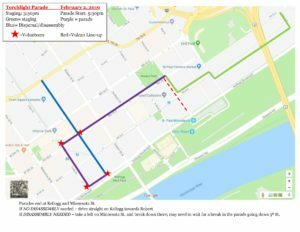 In the past, there has been plenty of on-street and ramp parking available in St. Paul before the parade line-up time, as long as you arrive early enough. Several people have found spots in the Cray Plaza parking ramp, and this location is not far from the parade end. Meters are enforced in St. Paul on Saturdays see details for meters and ramps at St. Paul Parking Info. Mike Schatz: In 2011 and 2012, I parked in the Science Museum ramp and was able to get my member parking rate (you must have a current member card with you to get the rate). While this ramp is far from the parade start, it is pretty close to the parade end, and I was then easily able to exit to Shepard Road. In 2014 I parked across Shepard near the Caribou for free parking, but a couple of extra blocks walking.